(Nanowerk News) Researchers in the Nanofabrication and Devices group, in collaboration with the University of Pennsylvania, Advanced Diamond Technologies Inc., and Innovative Micro Technology, have discovered that defects at the grain boundary in ultrananocrystalline diamond (UNCD) hold primary responsibility for the fundamental mechanism of energy dissipation ("Mechanical stiffness and dissipation in ultrananocrystalline diamond microresonators"). 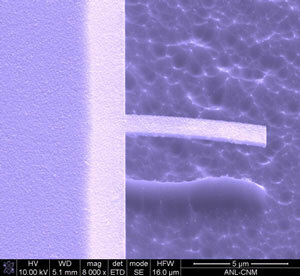 SEM micrograph of fabricated UNCD microresonator. Because of a high Young's modulus and high sound propagation velocity, UNCD materials hold potential for fabricating high-frequency microelectromechanical (MEMS) resonators. However, their mechanical dissipation at high frequency, which is important for developing high-frequency resonator applications, is not well understood. Dissipation in UNCD cantilevers was determined by using ring-down measurement under ultrahigh-vacuum conditions, and the quality factor measured in the range of 5000-16000 at kHz resonance frequencies. These studies reveal that dissipation in UNCD films is mainly due to the presence of defects such as nondiamond-carbon bonding at grain boundaries.